Moon Sworn is the 9th book in the Riley Jenson Guardian series by Keri Arthur and a Dell Fantasy. Shape-shifting werewolf and vampire Riley Jenson is through with death - causing it, solving it, surviving it. Her soul mate, Kye Murphy, is dead - and at Riley's own hands. Not even the seductive embrace of her vampire lover, Quinn, can fully ease her mind, for she has begun questioning everything that makes her Riley - including her job at the Directorate. Now, the ritualistically slain bodies of ex-cons have started turning up. Reluctantly, Riley takes the case, but something even worse is waiting in the wings. A vicious enemy from her past is determined to strip Riley of everything that gives her life any meaning: her lover, her brother - and even her own identity. Can Riley survive this ultimate assault? All she knows is, she must fight one last time to find answers, before everything goes dark forever. I have truly enjoyed the Riley Jenson series - and hate to see it end. 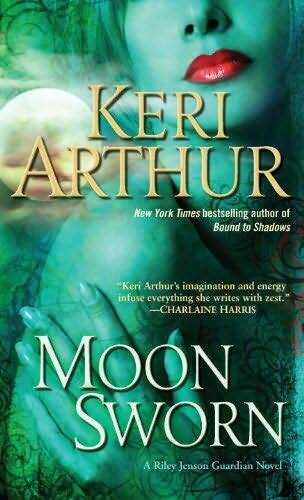 But Moon Sworn was a great read and wrapped everything up very nicely. Riley is still trying to come to grips with the loss of her friend Kade - and the death of her soul mate, Kye. It is not unusual for a wolf to perish without his/her soul mate - and for Riley, it is a day to day struggle just to keep going. Fortunately, Riley is surrounded by people who love and need her: her brother Rhoan and his lover Liander, her lover Quinn and the people she works with at the Directorate. But Riley has changed, and she needs for her life to change - especially now that she and Liander are bringing a child into the world via surrogate. I give Moon Sworn 5 out of 5 stars. Such a teaser for a review lol, I'm a huge fan of this series and was trying not to read any reviews until I've read the book myself because I didn't want to read spoilers but I couldn't resist, and after reading your review I'm that much more anxious to read the book! I like this series as well. :) And I was pleased with the wrap-up. When I do my reviews I don't give spoilers. LOL I don't like reading them myself - or having them told to me. :) I will never forget one of my daughters friends - she read a book before I did and blurted out a pivotal point - I was so disappointed - I didn't read that book or a long time and it was one I had been anticipating. Proud I was able to skip reading few spoilers in there. I can't wait to get my copy!